It has been almost a year since the last time we put two music-minded handsets face to face – as you probably remember, back then these were the SE W880i and Samsung F300. The former held the upper hand, although the F300 was more than a passable performer on the music front. This time around we are introducing a couple of changes to our routine procedures for comparative reviews. Like before, it is not only the author’s position that is taken account of, the focus group (three men for this article) also has a lot of weight. One of the phone makers humiliated me for recruiting this few people, well, it can’t be helped – the members of the focus group weren’t paid and kindly agreed to help me for free. I suppose we need to give them some credit here too, so these were: George (he never stays with one phone for too long and almost always employs the for playing his favorite tunes, in a way he is a super-advanced used, for not only he is a savvy consumer, but also a developer), Andrew (worships Windows Mobile devices, which is the reason for a lot of running jokes between us, nevertheless, his participation allowed me to view the things from a different and interesting angle) and Alex (my neighbor, who hasn’t changed his Nokia 5500 yet and he couldn’t care less about the market’s latest and greatest trends – admittedly, the most unbiased user of us). Also, this time I took the liberty to assess these two devices along with these guys. Our rating system hasn’t changed – same pass (+) and fail (-), but! the device that will score for best sound quality will get an extra “+”, and on top of that I reserve the right to give another point to whichever device I favor. Now, a few words on what was my role in all this – naturally, I was guiding and giving briefings to the focus group, although I had nothing to do with their subjective assessments. For example, I took a backset when they were judging the N81’s and W960i’s audio quality and design, but I had to clarify a lot of other things, for instance not everyone knew which phone could play Internet Radio. But honestly, I’m stretching the truth here a little – I also took part in giving away “+” and “-“, and sometimes they had an impact on the results; on the other hand, as we go deeper into this review, you will see that this was more a necessity. Probably, the second part of the preface should explain ourselves, why did we pick these handsets. First of all, they are two rivals, smartphones with boatloads of memory onboard and some other things in common. 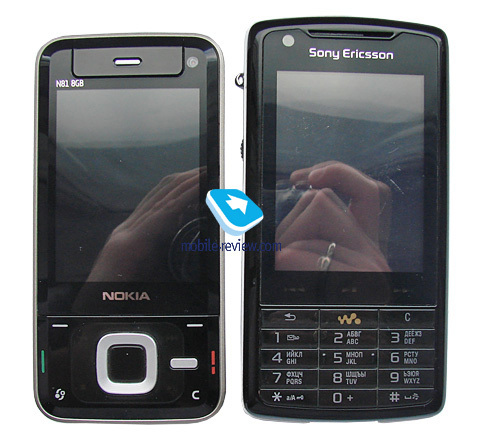 Secondly, to a greater or lesser extent, they are both follow-ups – to the N91 and W950 respectively. A year ago we had put these two phones head to head, so we were curious to see how the things stood then. Thirdly, either of the smartphones is an experiment in a way – the W960 paved the way for the G900 and G700, whereas the N81 is the first offering to sport the next iteration of N-Gage (along with several other “first-of-a-kind” things). This way, both companies are experiencing certain hardships with selling these two phones, especially Sony Ericsson with its W960i that premiered with a very hefty price tag that couldn’t be justified no matter how you sliced it (the N81 8Gb wasn’t all rainbows in this sense either, but it was still a tad easier on its owners’ wallets). But I imagine by this summer both phones will see some price cuts, and that will be the time when this piece will really come in handy to choose the best of the alternatives. Now, hold on to your hats, as we take the plunge. 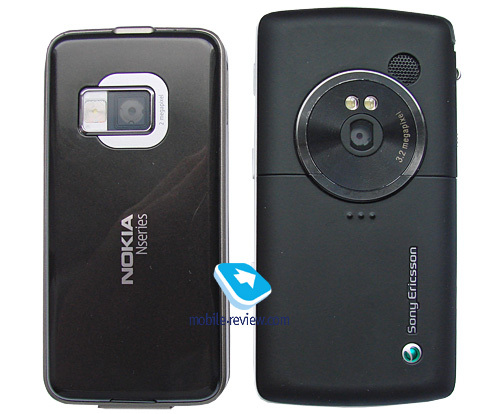 The SE W960i employs Sony Ericsson’s trademark FastPort socket, while the Nokia N81 8Gb comes with a bunch of them – 3.5 mm jack for headphones, slim proprietary socket for charges and microUSB for data. But the main thing here is the presence of a 3.5 mm audio jack – all other things aside, we are looking at music-heavy solutions, and with the W960i the user can enjoy a set of custom earphones only by plugging them into the bundled headset. No matter what the maker says, this setup isn’t particularly encouraging, plus the cord’s length can make up to 2 meters, which is huge. Another fact speaking against the absence of a 3.5 mm jack, is that with the headset connected to the phone you will have to use its inbuilt microphone, while with the N81 you are free to employ the phone’s mic even with a pair of earphones plugged in. On the other hand, SE’s own headsets (be it the bundled unit or some other model) are good enough to stay with you after you take them out of the box. Nevertheless, knowing this is little help in the case of the W960i, since it reaches the pinnacle of audio performance with the DS-970 or DS200/220 Bluetooth headsets, unfortunately neither of them comes boxed with this phone, meaning that you will need to shell out extra 100-150 USD, whereas replacing the N81 8Gb default earphones won’t bash your wallet as hard (you can even turn to some Sony-branded offerings retailing for 60 USD or so). Thus the value of a standard 3.5 mm jack perched right on the casing can’t be underestimated. It is also worth nothing that the N81 could well have its charger and data ports merged into one. That said, we have three “+” for the N81 8Gb from the focus group, I will also give it thumbs up for having a 3.5 mm jack onboard – such a vital thing for any handset that takes music seriously. Various accessories and technological talents for them always enhance usage experience. Both handsets come with support for A2DP and handle all popular stereo-headsets hands-down, what is more, either of the companies offers a wide range of extras for its music-centric solutions – speakers, headsets, cables and so on, so rest assured you will have a lot of gadgets at hand to entertain yourself. Now as regards to the sales packages. 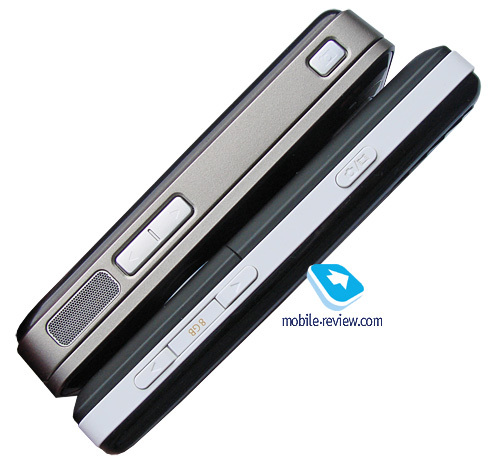 All in all, they are very similar, but the N81 8Gb comes bundled with a remote control, whereas the W960i doesn’t. Furthermore, the W960i couldn’t get along with the HPM-82, and we have no idea when the HPM-90 that will work is set to land in local stores. As far as bundled software goes, these smartphones come packaged not only with a standard suite of applications, but also utilities for managing music, which is really a good thing, however 99% of users will simply connect in Mass Storage mode and dump their tracks onto the N81 or W960i via default tools. 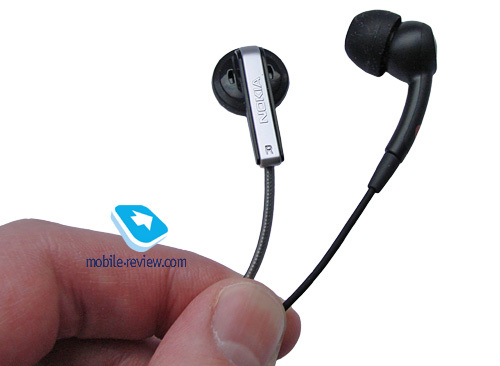 We can’t overlook the fact that the N81 8Gb’s bundled headphones are much worse what the W960i comes packaged with (HPM-70 headset), although this letdown is made up for with the ability to connect a custom pair of earphones directly to the phone. 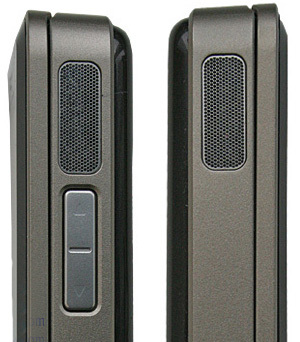 The focus group had a split decision – two votes went to the N81 8Gb (largely thanks to its remote control), and one member gave the W960i a nod for the default headset. As far as music playing phones go, I deem headphones (rather than a remote control) a more essential factor – not many will go ahead and buy them separately, for the most part people prefer to just plug what comes boxed with the phone in and play, or that’s the way I see it. So, turns out, it is even – 2 votes for either phone. That’s why we take the liberty and chalk one up for both the N81 and W960. Both solutions are positioned pretty much in the same vein, that is, as multimedia-ready solutions for youth ready to shell out quite a bit for their gadgets. Interestingly, these two phones have very similar defects in build quality, for instance their back covers creak, on top of that, in the case of the N81 8Gb setting the battery compartment cover in place properly takes some practice (I often hear people complain about enormous gaps found in the N81, while they are solely due to the misplaced battery cover). The N81 and the W960i have been finished along the same lines – black glossy front that gets smudgy and dirty in no time, sides decked out in white (W960i) and beige (N81); now for differences: the SE’s smartphone enjoys a velvety fingerprint-resistant back cover, while the N81 has a smudge-magnet instead of its back cover. Size-wise, the W960i is a fraction bigger than the N81, but neither of them is pocket stretching. Another thing to keep in mind is that the W960i is a candybar-type phone, whereas the N81 is a solidly built slider with a decent sping-loaded mechanism. Curiously, both devices got negative feedback from the focus group (and I tagged along) – it is quite bewildering to see a couple of phones that retail for this much money yet have no metallic accents in their designs and on top of that then to creak at times. However, we had a small fight over whose design was better – eventually, the N81 8Gb got three nods for having a more no-nonsense and complete looks, I quote: “the N81 is more conventional, that’s why I think it looks better with very little fancy or youth appeal. 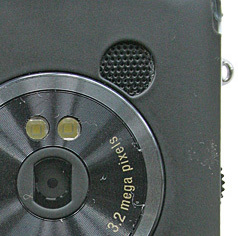 The W960i’s design generated responses like this one: “it looks like a mixed bag, stitched together from pieces take from a whole lot of other phones – probably they wanted to make a phone for youth, but what’s with its black color then?” As for my vote, it goes to the Sony Ericsson W960i, mainly because of its black-and-white color scheme. All up, neither phone scores for build quality, the Nokia N81 8Gb gets a “+” for its design and the W960i earns only a “-“. I suppose we will leave this result as it is for now – it may affect the Total in our final table, that’s why. Here the members of the focus group were offered to play around with the N81’s and W960’s music players via their music controls; I was more interested to know how they felt about the most common actions – Play, Stop, fast forward, jumping between tracks (software abilities of these two players will be reviewed in a dedicated chapter). But for starters, let’s take a closer look at these two devices. 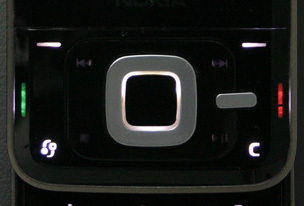 The Nokia’s smartphone has its music keys mounted around the five-way joystick, including the Play/Pause, Stop, Rew and FF buttons. Moving around track lists is done via the joystick and OK key; perched on the right-hand side is the volume rocker, also there is the hold switch for locking the keypad, which is very useful at times. 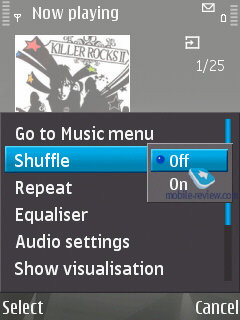 By the way, the N81’s music controls are always on, whatever applications you are in. 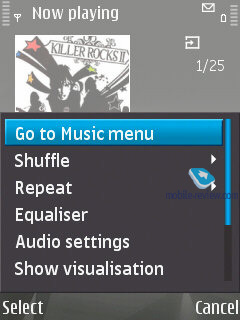 Apart from that there is a shortcut key that allows for one-touch access to multimedia applications (music player, for instance). The SE W960i runs with a wholly different philosophy, which isn’t as intuitive as its developers think. Let’s start with the fact that music playback is controlled by three touch-sensitive buttons nested on the front – Play/Pause, FF, REW. Nothing wrong with this setup, but the truth is, these controls are active only when you are in the player application or call it up from the standby mode with the help of the JogDial. Apart from these keys there is also a shortcut button, using which you can jump to the currently playing track or minimize the player. The volume controls are two separate buttons, which, as the focus group members noted, is not as convenient as the N81 8Gb’s rocker. 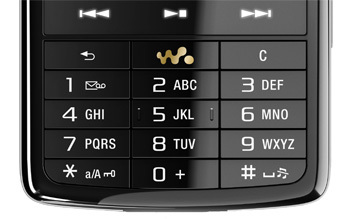 The W960i also employs its JogDial for managing music and playback – specifically, with its help you can scroll through your music library and pick particular items; regrettably, though, it is of little use during playback, as all it does is allowing you to pick tracks in albums, playlists etc. The handset’s touch-sensitive buttons didn’t seem to appeal to our focus-group – they complained about it being not responsive enough at times, also they berated the W960i’s fast forward/rewind that wasn’t as convenient as that of the N81. 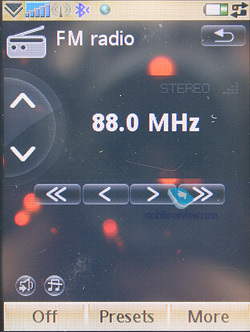 It is worth mentioning, though, that the W960i’s touch-sensitive display makes controlling playback so much easier – for instance, you can, using fingers or a stylus, point the place where the player should jump to within a track, whereas with the N81 your only option is to jam the fast forward button. However since both smartphones enjoy progressive fast forward, and on top of that the N81 8Gb is much faster in this sense, it is not that much of a disadvantage. Furthermore, even though the engineers that designed the W960i tried to utilize some benefits of its touchscreen in the player application, they haven’t done that much for its usability after it. Take one of the W960i’s key feats – the iPhone-esque list navigation, when you simply drag your finger down to scroll through the list. In practice, though, this feature works in a very mysterious way. Plus you can’t lock the keypad without digging deep into the menu – I suppose, I shouldn’t tell you why pushing a small hold switch is more convenient. George came up with a very precise bottom line on music controls in these two smartphones, hats off to him: “The N81’s controls are more like your favorite slippers, which are the only thing you want to have around, whereas the W960i is more like a pair of crudely crafted, yet shining shoes – fancy, yet very fiddly to use. The focus group members didn’t like that the W960i’s music keys were off in all applications but the music player, plus they were irresponsive at times; another niggle was with the awkward implementation of touchscreen and JogDial for controlling music playback. 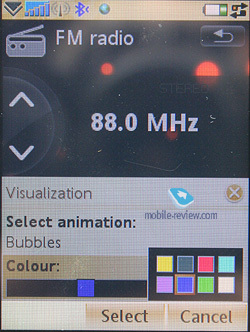 The N81 8Gb’s controls are much more straightforward and efficient. 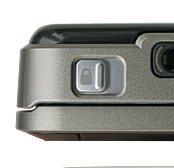 What’s more, a huge advantage of the N81 is its hold switch on the casing. So, without giving it much thought we gave the N81 8Gb a nod, and nudged the W960i. 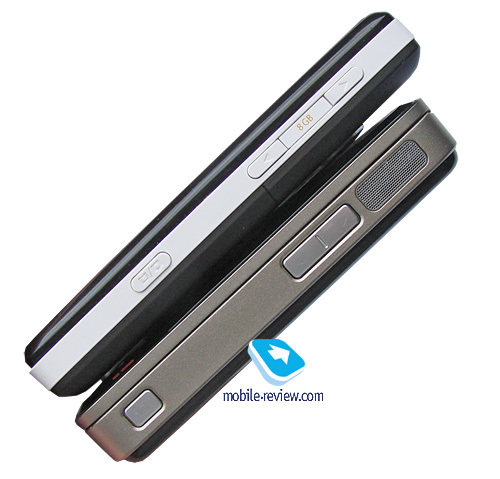 The N81 8Gb utilizes a 1050 mAh cell (BP-6MT), where as the W960i employs good old BST-33 (950 mAh). I carried out all tests on my own and then presented the focus group members with the results, so that they could give their verdict. For these non-stop music sessions I used bundled headsets, set the volume level to the max, enabled Repeat (all tracks were played from bundled storages), put SIM-cardw in (no calls were made or received) and disabled Bluetooth and Wi-Fi. The N81 stayed up and running for around 10 hours, a tad more than that even, whereas the W960i ran out of juice early on its seventh hour. Apparently, there three hours can make all the difference, especially when you think who much calls and other interactions with the handset will affect its music time. We all agreed that the N81 8 Gb was the winner in this contest. Another thing of note that the consumers usually note about the W960i is its very spacious battery compartment, that looks like it was designed for a different cell (for instance, the one carried over from the P1i does great in the W960i). That’s why I would like to draw the manufacturer’s attention to this fact – why your music smartphone doesn’t come with the most capacious battery around? Both devices come equipped with FM-receivers, and neither is without own failings. For starters, I made the focus group members have short sessions with either of the phones (in both cases we used earphones taken from the HPM-70 headset) – they listened to different radio stations at different volume levels and had no way to peek at the device they were using. As far as quality is concerned, the Nokia N81 8Gb had the best of it, the focus group members also praised it for outputting roughly 20 percent higher volume, yet couldn’t overlook that fact that this phone was able to tune in to fewer stations. But after all, we have an unanimous decision – the N81 scores, the reason being that it is what we actually hear that matters most. But another thing worth taking account of is how these applications actually handle. Let me remind you how they look – both devices can display current station’s frequency on the standby screen, allow the user to jump between stations from there, as well as put a shortcut to the radio application. 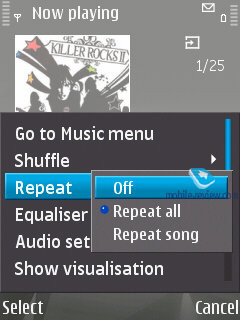 But in the case of the Nokia N81 8Gb you will need to download a catalogue with radio stations for your region first. Basically, it is possible to do without it, but if that’s the case, then you won’t see station names. Once the catalogue ends up on your phone, it will feature 32 items (for Russia), including the most popular titles; by and large. The reception quality is pretty adequate; the radio app itself is very spartan looks-wise – better find out more about it in our exclusive review of the N81. Speaking of interesting feats, we can’t overlook the ability to play radio over the loudspeaker; we were also somewhat bewildered by the fact that station names were uploaded only via GPRS, whereas Wi-Fi was not an option (at least the settings allow picking only from cellular data). The W960i is a much more capable performer on this front – it packs in RDS, can show latest bulletins on traffic jams and so on. Also you can play radio over the loudspeaker (provided that you have plugged a headset in), make use of the TrackID functionality and enable mono mode (why would you, though), plus there are some nice visual touches to the radio application, which we surely appreciate. That’s why we had a hard time deciding which phone deserved a “+” – I didn’t agitate for either of them, by any means. So here is the compromise we decided on – TrackID was appreciated separately, and while the W960i’s player had more visual appeal, the things that really matter are straightforward interface and sound quality, which weren’t the fields where it excelled – we found its search and autosave features worked in a somewhat bizarre way, as we weren’t able to happily jump between them back and forth like with the Nokia N81. On balance, the N81 8Gb got four votes out of four and thus earned another point. If you think that a music-minded handset should have no other skills beyond a music player and radio, then you are mistaken. 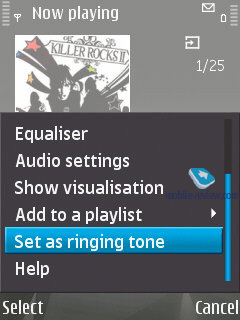 For instance, the TrackID functionality found in the W960i is quite welcome, when you record a short audio clip and then get it identified (artist, album etc) – this is pretty much the only way to find songs from commercials, movies in an eye blink. But Nokia also has a couple of aces up its sleeve, like Home Media, that allows the user to trade content between the phone and home PC/laptop over Wi-Fi, and goes as far as enabling you to play music from shared folders. But in truth, this functionality can appeal only to a bunch of enthusiasts these days, whereas TrackID is a bit more straightforward. 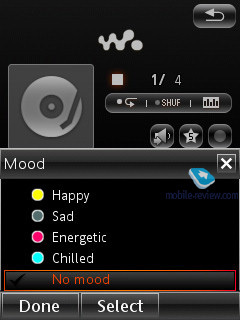 But that’s not all, the N81 also enables for SIM-less music sessions (and wireless connectivity options don’t go anywhere at that). That’s why both phones score on this front. I’m not going to pore over the N81’s and W960i’s players, for you can learn more about them in respective reviews. 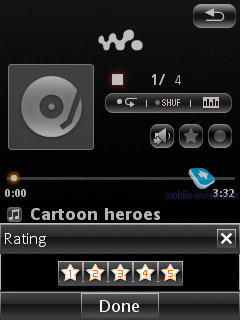 Both enable Album Art (the W960i can even magnify the image once you tap it), sport a bunch of visualization options, and basically share the same approach to music. During playback you will see current track’s number, album art, track and title and artist (the W960i show album titles too), duration, settings. But what the SE’s phone fundamentally differs from the N81 in is its touch-sensitive screen, allowing you to enable Repeat, adjust an equalizer, switch to the loudspeaker mode, set rating and mood in one touch, whereas with the N81 you will need to enter its menu, although by and large it doesn’t take awfully longer to setup. So far they seem pretty much equal, but things are about to change – we are about to bring up the music menu and inspect what sorting options are offered there. 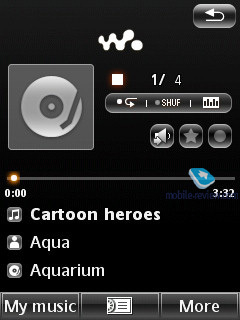 The N81 boasts the following categories: all tracks, playlists, artists, albums, genres, composers, whilst the W960i’s options include artists, albums, complications, tracks, mood, playlists, auto playlists and favorites. While this system doesn’t seem like much, the auto playlists menu features Most Played, Recent tracks and Time Machine for picking out tracks released in a specific year, plus you can make use of bookmarks that can be created right during playback. Apart from that, the W960i shows off an iPhone-esque list scrolling system, where you page through your music library with fingers (although it doesn’t scroll smoothly, as you can go only one item up or down at a time). 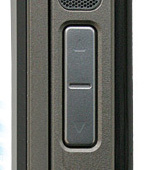 The focus group members had various opinions about these players – two of them liked the N81’s dedicated multimedia button, which allowed for one-touch access to the Now Playing menu, music, podcasts, playlists and random playback of all tracks. 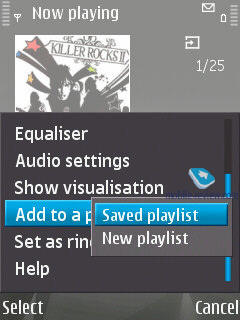 The W960i’s player key only brings the Now Playing screen up without any bells and whistles. 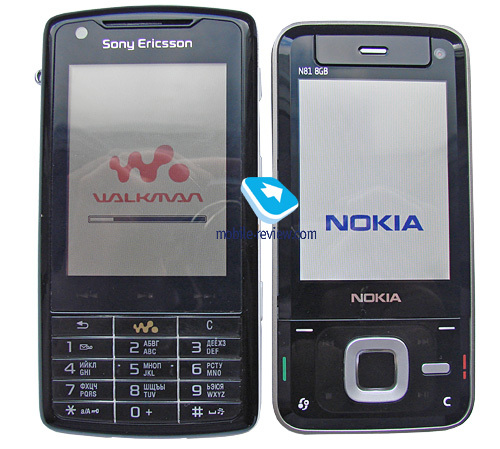 However, after some heated debates, the Sony Ericsson W960i booked three votes, while I appreciated Nokia’s no-nonsense player design. I would really love to see Nokia’s phones come with such a powerful set of sorting options as the W960i – it is not always fun to wonder around the handset’s memory looking for a particular song, especially when there is a whopping 8Gb of storage onboard. It is impossible to overestimate the importance of data transfer speed as far music-minded phones with boatloads of memory inside – for the purposes of this challenge we tried to beam a 80.6 Mb song over the cables coming boxed with the N81 and W960i; all this took place right before the eyes of the focus group members. We used a laptop armed with a bunch of USB 2.0 ports, Windows Vista (it is so cool to say “I have Vista” these days, though no particular reason for using it here), plus we enabled Mass Storage mode on both phones. The W960i sucked the file in in around 16 seconds, whereas the Nokia N81 8Gb slugged at 2 minutes 44 seconds. Honestly, I was completely befuddled by the latter’s performance and tried it out with another notebook, this time around with Windows XP installed on it. Again, we didn’t install any custom applications or drivers for data transfers. Surprisingly, the N81 didn’t fare much better – still around 3 minutes. 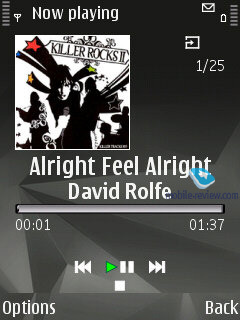 Thus, filling up the N81’s 8Gb with music will take much longer than the W960i, and we are being soft on it. Probably things will change if you install the music managers shipped with these two handsets (especially in the case of the N81), but I chose not to do so on purpose, as not all users care about unpacking software CDs at all, preferring to stick to the plug-n-play scheme. Obviously, the W960i earns one a “+” for offering great data transfer speeds. Either of the phones has Wi-Fi onboard and both pack in enough horsepower to handle internet radio stations, although the vendors haven’t cared to make the user’s life easier by including catalogues with stations, allowing him to add new items on it, edit already existing, ect. So, basically, both smartphones failed on this front, for lacking usability in this department. Although, I should note that it is quite strange to see that Nokia’s music-centric smartphone doesn’t come with a decent Internet radio application, given the prowess of the N800/N810 on this front. No music phone can do without a decent loudspeaker, since it makes all the difference whether you will hear call alerts or not, or will be able to use the phone as a boom box. For this test we decided to take the easiest path and just turned on the same song on the W960i and N81 and it turned out that the Nokia N81 was louder and clearer sounding-wise – that’s what we all agreed on. Naturally, it is still not the Samsung Serenata, but already a fair bit better than the W960i’s somewhat muffled loudspeaker. Basically, the most essential criterion rounds out this review. We thought there was no need to get too sophisticated with, that’s why the focus group, including myself, just listened to a couple of tracks and then assessed the quality of each phone. So, let’s get straight to the scores, but before we jump to them, let me clarify the methods we employed for this challenge. Both handsets had the same set of tracks uploaded, had their equalizers and other effects disabled, and also we used the highest volume settings (or a tad lower, when requested by a focus group member). The routine was as follows: we listened to some track with one of the phones, then played it with the other one, rated their performances and moved on to the next song. Before we start, I should note that had we utilized Nokia’s default earphones for this test, it would’ve ended up losing in every single round. Therefore, much like with the radio test, I decided to use the headphones torn away from the HPM-70 headset, yet without the N81’s bundled remote control. So how do you read this table? The main thing here is the “Total” line, where you will see the number of nods either of the phones got, and the smartphone with most “+” to its name scores in this contest (the same holds true for specific songs – three pluses and one minus equal to one plus). By the way, I’m going to ask our readers for some assistance – for the next comparison we will need a new bunch of songs, we’d especially welcome all suggestions on something heavy on bass. It doesn’t take a math genius to see that the N81 8Gb is miles ahead, and naturally it earns another point in this contest for offering better audio quality indeed, on top of that we found that it was louder, clearer and juicier as far as its sounding went. Although, it occurred to me that the people that put together the N81’s sales package did everything possible to mar the handset’s audio performance – personally, it took me quite a while to find the right pair of earphones that went well with the N81 (Sony MDR NC-22). On top of that, the phone’s remote control affected the sound quality it offered, which was noted by all members of the focus-group. We can’t really say that the W960’s sound quality is abominable – as long as you don't put it up against some other offering, it is pretty much passable, especially for consumers not bent of music. But honestly, I can hardly imagine what else can interest them in a music playing handset in this case. 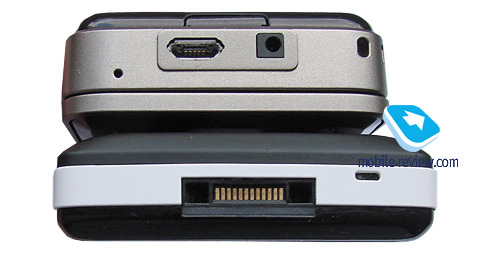 The Nokia N81 8Gb supports the following file formats: AC, AAC+, eAAC, eAAC+, MP3, MP4, M4A, WMA, Mobile XMF, SP-MIDI, AMR (NB-AMR), MIDI Tones (poly 64), RealAudio 7,8,10, True tones (WB-AMR), WAV; it also deals with various bitrates for mp3 files, including VBR. Upon synchronization with Windows Media Player 11 and newer versions, you can make use of DRM-protected files (Janus DRM). The W960i handles these formats: MP3, AAC, AAC+, E-AAC+, WAV and m4a; it doesn’t have anything against various bitrates or VBR. Third-party applications (available for both smartphones) will enable .ogg tracks, which are so popular with music aficionados. The phones also sport a bunch of equalizers, with the W960i boasting Sony Ericsson’s trademark MegaBass, whereas the N81 allows creating own setups (which have a more significant effect on the way the phone sounds). So, the bottom line is this: the Nokia N81 has earned more points (eight, to be precise), most of which are scores on the most vital fronts. And the W960i is a different creature – no doubt, it is an interesting product, it is handy in use, but… only as long as you don’t face it off against its closest rival. Some words on pricing. As of today, the W960i retails for around 730 USD (in Moscow), whereas the N81 8Gb is priced in the neighborhood of 570 USD, which is quite a difference given that the former is essentially behind the N81 on most accounts, saving for the times when you beam music over Bluetooth. But if you shell out on a wireless headset (like the SE DS-200) for the W960i, its sonic experience will benefit big time. Although, doesn’t it get too steep with all these extra expenses accounted for? Probably a better way to go for the some money is the iPhone or the N81 8Gb? You may well object and stick to the fact that the W960i features a touch-sensitive display and is second to none, leave alone some N81. And I will agree; however, while smaller, the N81 8Gb’s display is definitely on the bright side and oozes quality, allowing the user to watch clips and short cartoons and enjoy them very much. Plus, don’t forget it comes equipped with the N-Gage service and Nokia’s own music store. Wrapping it all up, a piece of advice for those contemplating a move from the N91 to the N81 8Gb. If sound quality is what you care about, then you should experience no problems with it after playing around with a couple of earphones. But if you put style above everything else (metallic accents, build quality, etc), then it will be reasonable to wait some more for another music-heavy monster. But, it seems to me that the time of such mastodons are long gone.